The chart below shows how the Pandavas are related to their wives and sons. Panchali was the common wife of the Pandavas. 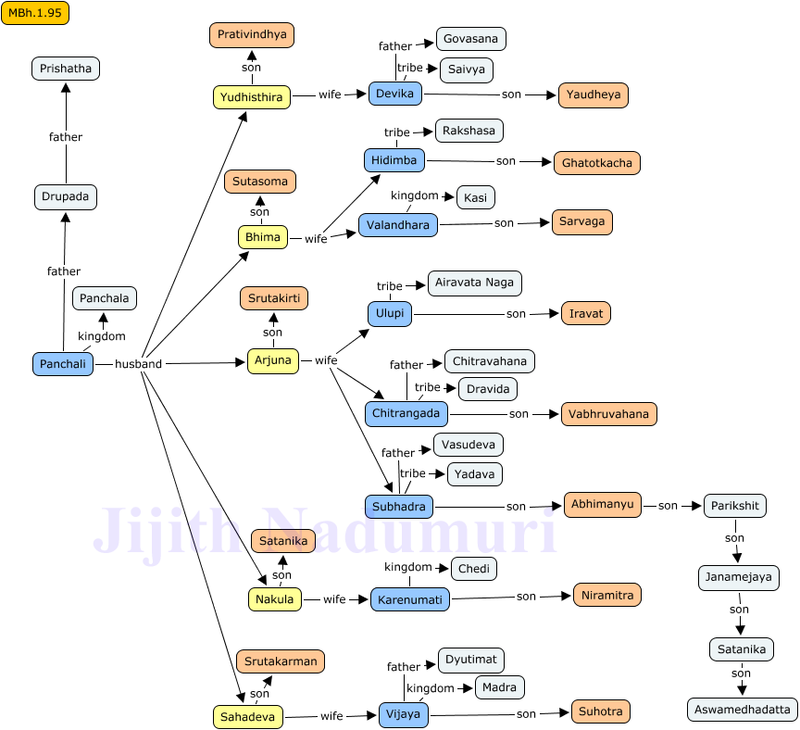 In this entity-relationship-diagram, (the typical diagrams that software-professionals like myself make to describe software architectural entities) Panchali is found to be in a central position. This was the result of proper arrangement of the entities in the diagram. But this was not without any relevance since Panchali was the unifying factor of the five Pandavas. She had played a crucial role in strategical discussions along with the five Pandavas and her views were part of their political ideology and governing policies and these played a central role in their policy making. Other wives of the Pandavas too were great personalities in their own right. Among them the Yadava lady Subhadra was prominent since her grandson Parikshit became the successor of the Pandavas at Hastinapura. She, as per many versions of Mahabharata, was a skilled chariot-driver and a warrior, a trait shared by many Yadava men and women. It is learned that in the Subhadraharana episode (Arjuna eloped with Subhadra), Arjuna defended the arrows of the chasing army of the Yadavas while Subhadra rode the chariot from Dwaraka towards Indraprastha. Arjuna's other wives viz. Ulupi and Chitrangada were never lesser in their boldness. Ulupi, an Airavata Naga princess united with Arjuna and beget Iravat in a bold move exercising her self-choice (Swayamvara) . Chitrangada, a Dravida-Naga princess was the ruler in charge sitting in the throne of her city Manipura on behalf of her father Chitravahana who was devoid of any sons. Rakshasa princess Hidimba chose to be the wife of Bhima, against the wishes of her brother, yet another Swayamvara (self-choice). The sons of the Pandavas from their wives viz. Panchali and others were themselves great warriors and heroes. Ghatotkacha, Prativindhya, Iravat, Vabhruvahana and Abhumanyu were the prominent among them. Through Ghatotkacha, the Pandava dynasty spread into and merged with the Rakshasa tribe, through Iravat it spread into the (Airavata) Naga tribe and through Vabhruvahana it expanded into the Dravida (Naga) tribes. Through Abhimanyu Pandava dynasty spread the fame of their ancestral Kuru dynasty.